This card hanger pattern has proved exceptionally popular over the last few years, and can be bought as a download from my Shop for £8. 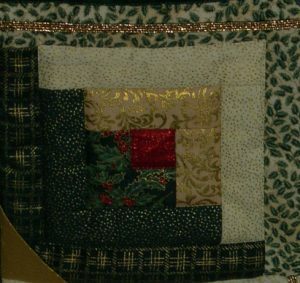 Two long pieces of log cabin patchwork are joined by a tape or strong ribbon, so that they can hang over a door, displaying cards in e.g. your living room on one side, and in your hall on the other side. Put up the hanger at the beginning of the Christmas period, and gradually fill with cards as they arrive. As each side can take up to 14 cards, 28 can be displayed in total. Tuck cards at an angle under a piece of elastic, and support their bottom corner in a triangle pocket. Insert cards alternately from the left and right sides. After the celebration is over, simply remove the cards – the hanger can then be stored and reused as often as you like. This is an ideal project to use up scraps of Christmas fabric left over from other projects – but of course, you could choose a colour scheme to blend with another celebration such as a Golden Wedding, or to go with your decor. This project is made in the ever-popular Log Cabin design using foundation piecing. A product called Vilene Quickscreen is used for this, which has a 1 cm grid of blue lines on it, to get all the “logs” the same size. Can you see how the piece of gold elastic and the triangle pocket are incorporated into the last round? There is actually another way of arranging the Log cabin units to give a different overall design – instructions for both are included in the pattern, and you can experiment with the finished units to see which you prefer before making it up. I chose different fabrics (one dark and one light) for the setting triangles on the two sides of my hanger to see the effect – it’s hard to believe that the same mix of fabrics was used for all the Log Cabin blocks. 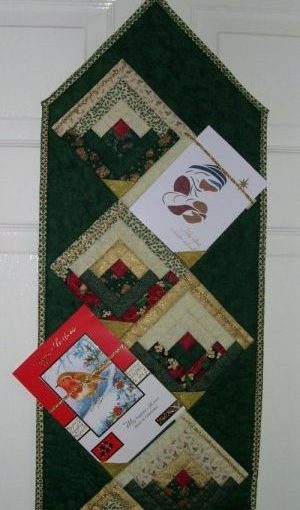 Some people don’t like covering up the patchwork with cards, and have made the pattern without the elastic & corner triangles to use simply as a wall hanging or table runner.